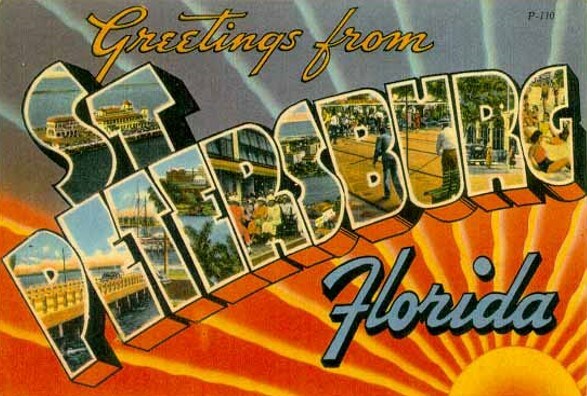 LUCY BURDETTE: Every year in the fall--the location changes each year--fans and writers of crime fiction flock to Bouchercon, the world mystery convention named after Anthony Boucher, an esteemed critic, writer, and editor of crime fiction. 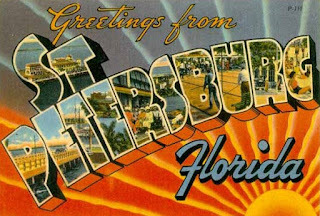 This year the conference is in St. Petersburg, Florida, as you can see above! There are panels and awards voted on by attendees and parties, lots and lots of parties. I especially love this quote from their website: "You can meet your whole bookshelf at Bouchercon." This year, I noticed a new award for the Best Online Content, ie. Website/Blog focused on mystery/crime fiction. Dru's Book Musings--Reading is a wonderful adventure! Reds, where else do you read about crime fiction? HANK PHILLIPPI RYAN: Oh, gosh, what would we do without blogs? All of the ones you picked, Lucy, are terrific! You know I'm part of Career Authors Which is a fabulous place for writers who want make a career of it--any genre! Tall Poppies, who also do their blog via Facebook. A marvelous and powerful community for readers. And there's always something to talk about on the Bloom page--all your fave books! Highly recommend all of them! There are so many more--Kathy Reel! Jane Friedman! but I'll let you all have the fun of listing them! Another site I like for news in the crime fiction world is The Rap Sheet, which always has the latest goings-on and links to items of interest around the web. Do we still say that? The web? And for an unusual offering from a wonderful crime fiction writer, Denise Hamilton collects her monthly LA Times columns on perfumes at her website. Yes, perfumes, some of which she links to mysteries, all of which are riveting reading. HALLIE EPHRON: So many of my favorites have been mentioned. I'm a big fan of Dru's Book Musings. Dru is a brilliant reader who won the Raven Award for her musings. To repeat, Jane Friedman -- both her personal blog and her subscription newsletter on the publishing business HOTSHEET. Though her posts are about writing and publishing, not mystery. INGRID THOFT: So many blogs and so little time! I’m a fan of “Mystery Fanfare” by Janet Rudolph because of the content, but also because it gives me an excuse to visit Janet’s other blog, “Dying for Chocolate” . If you’re looking for an international flavor in your mystery blog, look no further than “Murder is Everywhere”. Featuring ten crime writers from different parts of the world, it’s a wonderful resource for branching out when you’re choosing what to read next. Although it’s not strictly focused on mysteries, I’m a fan of “Writer’s Bone” . Their interviews (in podcasts and print) with writers from all genres are inspiring and never fail to entertain. DEBORAH CROMBIE: Oh, so much fun reading here! I love Mystery Lover's Kitchen, and the new CrimeReads is fabulous, and of course I love Dru and Lesa and Kathy Reel!! And I do read Denise Hamilton's LA Times column on perfume. But one of my personal favorites not yet mentioned is Femmes Fatales. Terrific female crime writers (obviously) and always funny and personal and interesting. JENN McKINLAY: Okay, any blogs I would have mentioned have already been named. So many brilliant blogs out there, it's a wonder we can get anything done at all! Now, it's true confession time, I'm not a blog reader. When you write four-five books/year you really only get to hit the highlights, so I read blogs when a person hands me a brilliant blog post and says, "Read this." With, of course, one great big exception - Jungle Red Writers. If anyone had told me a year and a half ago, that my day would go sideways if I didn't log into JRW to see who was visiting or what the day's convo was about, I would have said they were cracked. But now, after the sisterhood and fellowship I have found among the Reds, readers, and guest bloggers here, I truly can't imagine starting my day any other way! RHYS BOWEN: I think you've already mentioned my favorites. Janet Rudolph, Lesa Holstine, Criminal Element, Career Authors, oh and don't forget Femmes Fatales, with Charlaine Harris, Donna Andrews and I believe our own Hank is still a member. My real problem is time. Who had time to read more than one blog a day and our Jungle Red blog is so entertaining. I love that you ever know what is coming next,from true crime to recipes. It's like a good women's magazine without the tips on losing weight! READERS, tell us your favorite crime blogs! Your lists are so complete I don’t have any other blogs to add. Although I read other blogs from time to time, there’s simply not enough time in a day to read all of them. Jungle Read Writers is the only one I never miss reading . . . .
Wowee, what a great way to start the week: A whole new world of blogs to explore. Thank you! And thank you for creating and keeping on doing Jungle Red Writers; yours is the first blog I started reading and you've opened a whole new world of reading and writing to me. I am now never without an interesting new author to explore, book to read or site to investigate. I am so grateful for your commitment to this blog! In all honesty, this is the only mystery blog that I read on a regular basis. When I do read something from another blog, it is usually because I've seen a particular piece either talked about here or a link has been tweeted out from either Mystery Scene or Suspense Magazine. That said, I should probably be checking out at least a few of these blogs that have been mentioned in today's blog. Thanks for mentioning Wicked Cozy Authors right up front! That's my home base blog, and some days I read only that and this one. I don't think anyone mentioned Writers Who Kill, also good, plus I also drop by Mysteristas and Chicks on the Case from time to time. But as Jenn implied, so many blogs, so little time. Thanks for mentioning Mysteristas, Edith! And thank you for mentioning Chicks on the Case! We're a newer blog but growing, and having so much fun. I visit every blog mentioned here. Love Wickeds and Mysteristas. I also will add The Stiletto Gang and Writers Who Kill to the list, if no one's mentioned them yet. I have to spread out all my visits or I'd never have time to actually write! Thank you for this post! I read a good amount of these blogs already, but I will be checking all of the new ones out! Hopefully one day I will be able to go to one of the mystery conventions and meet some of you! What a dream come true that would be! All of you who write blogs—how do you make time to do it! Dru, are you reading every second of every day? Kristopher and Kathy, how much of your lives does it consume? What advice would you all give to someone who wants to start a blog? Blogging really is a second job. I get stressed out if I can't read on my lunch hour each day since that is one of my biggest reading chunks. And it is one reason I review more than just books on my blog. That gives me fresh content without having to spend every second reading. I love reading, obviously, but I also enjoy movies and TV, too. My advice to new bloggers is to go for it. Figure out how to balance it with the rest of your life. And remember that it takes time for a blog to gain readers. However, hard work will be rewarded. I read every day and I love my subway commute where I get at least 45 minutes of prime time reading each way. I devote about an hour or two after I get home from work on blog housekeeping and make up the rest on the weekend. My advice, start smart, find a niche and have fun. The fun shows in how much you give to the blog and your readers. So many fun places to find books! After JRW, my favorites are Wicked Cozy Authors and Femmes Fatales. But Jungle Reds is the only blog that merits a bookmark in my browser toolbars, and after reading the news, this is my first stop of the day. I love reading blogs and writing for them. JRW, and Wicked Cozy Authors are on my daily stop list, I try to comment, but often don't have time - - I am honored to be a member of both Mysteristas and Writers Who Kill and my blog partner E. Michael Helms and I are talking about getting Motive Means Opportunity up and running again. We had a blast doing it two years ago and we both miss it - Time is a factor, of course. It's all about pacing, and having fun! Reds are great at keeping the convo going with their readers - it makes all the difference. Commenters become part of the team and the blog - rock on Reds! Um, Maine Crime Writers? If nothing else we offer variety—Kate Flora, Lea Wait, Barb Ross, Jessica Ellicott, Bruce Coffin, me (as both Kaitlyn Dunnett and Kathy Lynn Emerson) and a half dozen more, all of us living and writing in the great state of Maine. Which i should have mentioned, Kathy! Oops. Yes, I should have mentioned too! Such a great list of contributing authors. I don't think anyone's mentioned Criminal Minds. Another good blog, although it's more likely to focus on craft. In reading today's blog post I realized that I read just about all the blogs mentioned, in addition to a couple of others. My favorite is JRW, but I do like all the blogs I read, or I wouldn't take the time to read them! Such a great list of blogs. I will be looking up some of them I haven't read yet. Thank you for mentioning Wicked Cozy Authors! Les Blatt has his Classicmysteries.net. "Podcasts and conversations about fine detective stories worth reading and re-reading." Martin Edwards has his doyouwriteunderyourownname.blogspot.com. Hank mentioned Lesa Holstine's Poisoned Pen blog, but I'd also like to mention Lesa's Book Critiques, which I read every day (in addition to Jungle Red Writers, of course). Lesa reviews mostly (but not only) mysteries and has become a friend through her blog. I felt I already knew her when I met her and looked forward more to meeting her than the authors I loved at Left Coast Crime in 2014 and again in 2016. She even invited some of us loyal readers to submit our own "top reads of 2017" on her blog this year. We have become a community, which is the greatest thing I can say about a blog. That's such a compliment, Margie. Lesa is indeed very special in the mystery world. Oh, Margie. A community. What a beautiful comment. Thank you for the tears in my eyes when I'm at work (smile). So many great blogs! I would wish for endless time to read them all--and then all the recommended books! In addition to JRW, I always stop by the Femmes, Chicks on the Case (https://chicksonthecase.com/) and the Wicked Cozy Authors blog. I love all of them. On the reviewer side, some I try to stop by as I have time are Polished Nails and Puppy Dog Tails, where the blogger always shows off her newest manicure inspired by the book she's reviewing (http://polishednailsandpuppydogtales.blogspot.com/), I wish I lived in a Library (http://iwishilivedinalibrary.blogspot.com/), and Escape with Dollycas into a Good Book (https://www.escapewithdollycas.com/). Then there's A Cozy Experience (https://cozyexperience.com/) and the new blog Chatting About Cozies (https://chattingaboutcozies.blogspot.com/). As a blogger, I wish I had time to read more blogs and support them. I feel a little guilty about it. But there are only so many hours in the day, right? Thank you for mentioning Chatting About Cozies Blog, Mark. I take time to visit fellow bloggers such as Carstairs Considers, Escape with Dollycas into a Good Book, Lisa Ks Book Reviews, and Dru’s Book Musings as often as I can. Every blogs shows a different view of the fantastic cozy mystery world. Not a big blog follower, except of course for this one, which I read every single solitary day! I glance at some of the others, particularly BOLO, and read some reviews as long as they don't sound like book reports. On the other hand I follow a great many writers on Facebook. And as everyone knows, I'm a devotee of the NYT Book Review. Right now I'm revisiting some favorites like COOKING WITH FERNET BRANCA by James Hamilton-Paterson, and THE GUERNSEY LITERARY AND POTATO PEEL PIE SOCIETY, by Mary Ann Shaffer and Annie Barrows, soon to be a film. It's good to see old friends again. I spend a huge amount of my discretionary income on books, and I suppose I should try the library again. When I did, years ago, I found myself on waiting lists but with little to read. And I absolutely HATE to think I must read on a time schedule. Often I start a book, get interested in something else, let the first one lie fallow, and then come back to it. Instant gratification is my middle name. Ann, my library system has recently eliminated fines. You might check with yours, and no fines means no reading deadlines. So glad I stopped by today! I try to read the Jungle Reds every day. Since I joined Instagram, I have been reading blogs like Crime by the Book by a bookstagrammer, Abby? She often writes about thrillers and noir novels. I also read the Cozy Experience blog by a blogger that I met via Facebook. Marie does online book chats with different authors. The recent chat was with Maia Chance, author of Agnes and Effie mysteries. I used to read the Naked Truth about Literature. I do not think it has been updated for a while. Thank you for the list of many blogs. I am going to check them out! Thanks for the shout out for the Wicked Cozys! As for blogs I follow regularly--right back atcha, Jungle Reds! Your ability to serve up fascinating content year after year is unparalleled. I also read a bunch of others that have already been mentioned. I'm too chicken to list them because I'll leave one out for sure. As Ingrid said, so many blogs so little time. You've mentioned most of the ones I frequent (my day isn't complete unless I stop here and Wicked Cozies), and I contribute at Mysteristas. Sometimes I only hit part of a blog or what's posted on Facebook, but at least the first hour of my workday is for "catching up on blogs." JRW is the only blog that I read daily......what an amazing group of women/writers! Somehow you have developed together, a common "voice" that comes across in each post, no matter which one of you is hosting......so positive, curious, informative, and fun! Thank you for the respect and authentic engagement that you show your readers. Thank you, Helen. It's readers like you that make it such a delight to be part of this blog! Helen, thank you! We all feel so complimented! JRW's only now with more choices; thx. My shortest post. Yes, of course we love Kaye!!! JRW is the only one I read every day and I go to BOLO Books at least once a week. I visit others occasionally when time permit but my preference go to reading books. I think you all have covered many of the most special blogs out there - and thank you for the mention of BOLO Books. JRW is certainly a blog that should be considered for this award, look at how many loyal followers say it is their first stop in the morning (I know that it is always mine!). That means you are doing something right! Thank you for mentioning dru's book musings and I agree, that JRW should be considered. You Write: "But one of my personal favorites not yet mentioned is Femmes Fatales. Terrific female crime writers (obviously) and always funny and personal and interesting." MURDER WITH PEACOCKS got my vote back in 1998; Donna Andrews has gone on to build quite a career! I really enjoy the humor in her books. She and her Femmes Fatales cohorts are priceless. Your lists are great. How about Maine Crime Writers? Thanks so much for mentioning Mystery Fanfare--and DyingforChocolate.com Love these recommendations. I found some new blogs to bookmark. How fun!